It is therefore useful to reconsider what was mentioned above about philosophical sources. The Renaissance saw a significant broadening of source material. 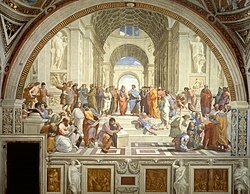 Plato, known directly only through two and a half dialogues in the Middle Ages, came to be known through numerous Latin translations in fifteenth century Italy, culminating in the hugely influential translation of his complete works by Marsilio Ficino in Florence in 1484. Petrarch was not able to read Plato directly, but he greatly admired him. Petrarch was also a great admirer of Roman poets such as Virgil and Horace and of Cicero for Latin prose writing. Not all humanists followed his example in all things, but Petrarch contributed to a broadening of his time's 'canon' (pagan poetry had previously been considered frivolous and dangerous), something that happened in philosophy as well. In the sixteenth century anyone who considered himself 'au fait' read Plato as well as Aristotle, trying as much as possible (and not always very successfully) to reconcile the two with each other and with Christianity. This is probably the main reason why Donato Acciaiuoli's commentary on Aristotle's Ethics (first published in 1478) was so successful: it blended the three traditions beautifully. Other movements from ancient philosophy also re-entered the mainstream. This was never really the case for Epicureanism, which was almost always caricatured and considered with suspicion, but Scepticism and Pyrrhonism did make a comeback thanks to writers like Michel Montaigne, and the movement of Stoicism made an impressive re-appearance in the writings of Justus Lipsius. In all of these cases it is impossible to separate the pagan philosophical doctrines from the Christian filter through which they were approached and made legitimate. This page was last edited on 16 September 2018, at 18:59 (UTC).